Shortly after I cast on for the Haruha scarf, temperatures dropped below freezing. I traded Shedir and Achernar for my Cold Weather Big Guns: a double-thick wool hat I bought from Montreal and a giant wool/angora scarf/wrap that my mom bought for me, and then I made it that much warmer by a slight accidental felting. Cold’s got nothing on these guys. It occurred to me one night, as I sat on my couch, wrapped in aforementioned scarf and covered in a blanket, knitting away on some delicate black lace, that this was foolishness. Haruha is no match for winter. Haruha is a lovely fall or spring fashion scarf, not a cold-weather workhorse. I put Haruha aside and cast on for the Anemoi Mittens. Made double-thick by stranded knitting and sealed tightly at the wrist with a cuff of corrugated ribbing, these mittens will be just the thing to replace my current gloves, which just stop abruptly at the wrist without the faintest gesture towards actually keeping out the cold. I’ve taken to wearing these gloves over my Endpaper Mitts, otherwise they do no good. And of course now, we are back to warmer fall temperatures. Knitting for the weather is clearly about as good an idea as trying to time the stock market. CogKnition posted this on December 9th, 2007 @ 2:45pm in Unfinished Objects | Permalink to "Folly. Fall-y. Fa-la-la-la-la-y." 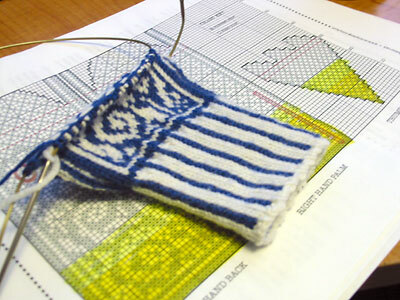 Your colorwork on that mitten looks great already, unblocked, even! But good call on abandoning the little lacy wrap; ah, utilitarianism. I sat on a couch the other night watching my girlfriend’s mom knit away at a blanket she was making for a gift. It was quite the show, and it was proof enough that what she was doing was something she culminated over the years. I will make sure she knows about the site! I love what you’re doing with those mittens. Amazing. It would take me a year at least to complete them. Can’t wait to see the finished product.